Planning a Caribbean holiday the entire family will LOVE! A family vacation to the Dominican Republic can make memories that last a lifetime. If you choose the Casa de Campo all-inclusive resort packages, most of your planning and vacation stress is off your shoulders – leaving you to relax and enjoy yourself. With plenty of activities for adults and children of all ages, including horseback riding, a private beach, and water sports, there's something to fit everyone's preferences. Many families love the together time, from the pool to horseback riding lessons and dining in the resort's restaurants. But what many returning guests like the most are the professional nanny and babysitting services provided with your Case de Campo rental. There are camps, planned activities, and a chance for the little ones to meet new friends. Meanwhile, mom and dad can enjoy a private afternoon at the beach, play a round of golf, or indulge in a couples massage in the spa. A typical day with the whole family starts off with a delicious breakfast buffet in the Lago Restaurant, overlooking the famous Teeth of the Dog and the Caribbean Sea. Try a made-to-order omelet, or load up a plate with freshly prepared breakfast pastries, bacon, or fresh fruit sourced directly from the islands. Prompt and attentive service makes your meal enjoyable, and with early morning hours, you can even watch the sun rise over the ocean. Dine al fresco for the full effect—a view of the stunning Dominican landscape, and the taste of local cuisine. Visit the Casa de Campo equestrian center for horseback riding lessons from a professional polo player – if you already have the basics mastered, there are even lessons for rodeo tricks! Or choose to take the whole family on a guided horseback excursion through the resort, ending at the facility's horse breeding center. 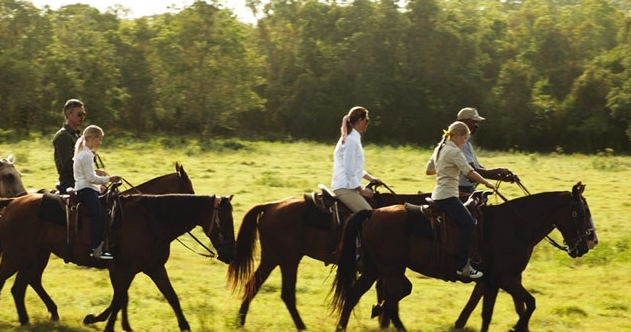 You'll be able to see the famous polo horses that Casa de Campo is known for, as well as receive a special tour of a working horse breeding ranch. The trip takes about 9 minutes, leaving you with plenty of days left. Stake our under a thatched palapa on the Casa de Campo private beach – you'll meet new friends from the resort and enjoy service for fruity drinks or a quick lunch. The oceanfront is clean and secluded, with plenty of space to build sandcastles or swim in the ocean. Or choose to take the family to the pool – there are diving boards and plenty of sunshine. If you like to dance, take advantage of the complementary merengue sessions on the beach during the day. It's the national dance of the Dominican Republic, and you'll have something fun to show off to family and friends when you return! Stroll over to the Marina – or use your private golf cart. It's a yachter's paradise, with boats available for rental or pleasure cruises for the entire family. Spend the day snorkelling, enjoying the tropical fish and warm Caribbean waters. When you're finished, have a light lunch at the Marina, or pick up some snacks at the grocer located nearby. The SBG restaurant at the Marina often features live music – your Casa de Campo concierge can tell you which days so you can plan accordingly. For dinner, choose one of several Casa de Campo restaurants. Return to Lago for a dinner buffet, or dress up to visit one of the five-star dining rooms. If you want fresh, hand-rolled sushi is available at Pubbelly Shushi, or treat the family to a low-key night with room service in your private villa. Whatever you choose to do, you'll be making memories set against a gorgeous tropical backdrop and Casa de Campo staff ready and waiting to make your vacation magical.